The E3 trade show is typically an affair dedicated to new video games, but last night at Sony’s E3 press conference, one of the biggest cheers went up for a game that’s 17 years old. 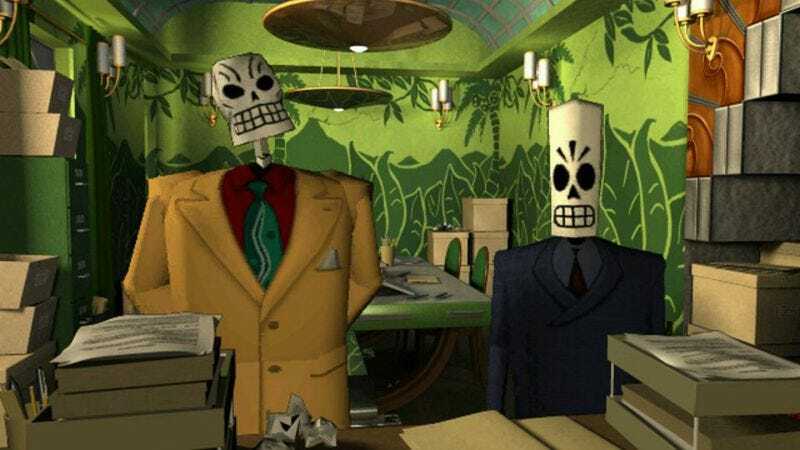 Grim Fandango, the soulful noir adventure game by Tim Schafer, has languished in obscurity for years despite the fact that it’s one of the most accomplished works in the genre. And now it’s coming back, as Schafer’s studio, Double Fine, is remastering Fandango for present-day consoles, starting with Sony’s machines. The remake of Fandango will show up on the PlayStation 4 and PlayStation Vita first, meaning that Double Fine is almost certainly receiving financial consideration from Sony. These deals happen all the time; it’s notable in this case because the last time Schafer was looking to revive this genre (albeit with an all-new game, Broken Age), the developer turned to Kickstarter. And given that adventure game fans pee themselves a little anytime you say the words Grim Fandango, a Kickstarter effort for this remake would have gotten instant traction. Schafer’s decision to opt for more traditional funding this time certainly is not a rejection of Kickstarter—different projects take different paths. But it does suggest that the crowdfunding site isn’t quite the silver bullet it was once thought for small and mid-size game studios who need an infusion of cash. Of course, Schafer already knew that, as Broken Age had its share of financial troubles despite fans’ outpouring of support.